Two years after being diagnosed with an autoimmune disease (Hashimoto’s), I decided to do something about it. When I was diagnosed in 2012, my doctor immediately put me on synthetic thyroid hormones to stand in for the hormones my body was not creating. Every morning I popped my pill, and went on with my day-to-day activities, all while ignoring my body’s screams for help. Two years later, I was suffering from extreme IBS, a myriad of digestive issues and secondary ahmenhoria. I came face to face with the realty that I could not put my health off another year; I needed to take action. I met up with a family friend who practices functional medicine and she introduced me to the concept of healing through food. She suggested I remove inflammatory foods from my body/diet: grains, dairy, refined sugar, soy and legumes. Hashimoto’s disease has a long-standing negative relationship with gluten, which mimics the thyroid hormone in some cases. Removing gluten as well as other inflammatory foods was the first step in taming my thyroid, as well as healing my gut. I removed foods causing inflammation, as well as processed foods and educated myself in a whole-food approach to eating. I started by eating whole vegetables, fruit, and organic and pasture-raised protein. I quickly learned if I wanted certain foods, like crackers or cookies, I had to make them myself. This was when Sweet Laurel became more then just a thought. I started to work with foods I could eat, like almond flour and coconut oil, as opposed to flour and butter. I fell in love with Himalayan pink salt for balance of flavor in my cooking and baking, and instead of table sugar, I sweetened my baked goods with maple syrup. In most recipes, I used organic and pastured eggs or found they weren’t needed at all! I kept it simple. I discovered the beautiful reality that a whole-food approach to eating doesn’t have to be complicated. In 2015, using these five core ingredients, I launched Sweet Laurel with the goal of sharing this approach to eating with as many people as possible. Here is a simple yet beautiful recipe I love to share with friends on late summer nights. The elegant topping of whipped cream and berries is a classic. Place eggs*, coconut oil, maple syrup and vanilla extract in a bowl. Whisk until well incorporated. Add almond flour, salt and baking soda. Mix until batter is formed, then pour into prepared pan. Discover more delicious grain-free, dairy-free goodness from Sweet Laurel Bakery here! 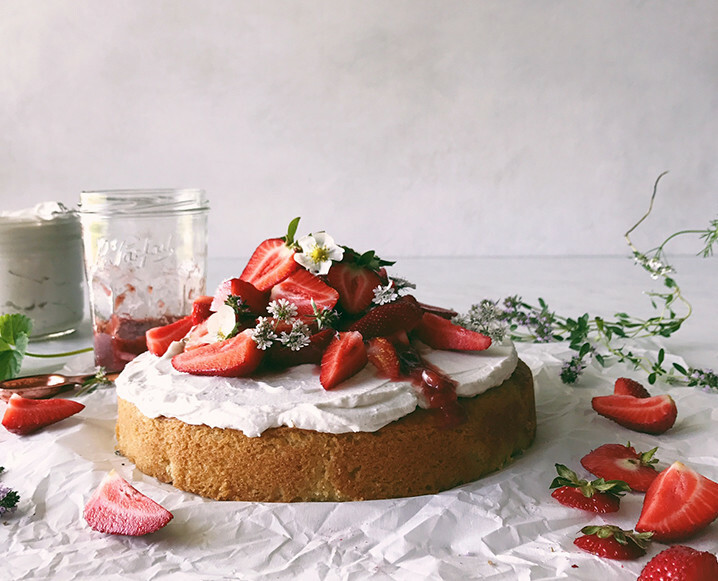 Share the post "The Best Vanilla Cake Ever (Happens to Be Grain+ Dairy-Free)"
Yes! Grapeseed Oil will work just fine. I made this for my daughter’s birthday, and it is really good! Everyone loved it! Yay!!! So happy to hear this Anne! Do you think I use coconut flour instead of almond flour? I can’t have nut flours and would LOVE to try this cake. Is there a way I could work with a non-grain flour to make it work? My babies 1st birthday is coming up and he can’t have nuts. I was wanting to see if you’ve tried coconut flour yet or not? Thanks! Grapeseed oil is one of the many junk oils. Use coconut oil instead. i live dray cake i must try this recipe. Can honey be used as a replacement for maple syrup? Is there a particular type of syrup you recommend or will any kind due? (I though syrup was loaded with sugar?) Thanks! Looking forward to trying this recipe. Hello Kris, you can definitely use honey in this recipe. We typically use 100% maple syrup as our sweetener. It is loaded with minerals and provides moisture in this cake. When compared to honey, 100% maple syrup actually contains less fructose per gram. does this work for cupcakes, too? Just made this. Amazing! And so easy! To others… I would never use coconut flour as a replacement. Any more than 1/3 C in any recipe and it becomes a stodgy, heavy and gross. Is there a butter cream type frosting I can use for this cake instead of the coconut whip?